You need storage. Now. You’re out of room for business records, inventory, farm equipment, your stamp collection, or all the bargains you snagged at Costco. The bottom line is, you need space. And you think a container might do the trick. 2) What size do I need? A 20’ container can hold the furnishings of a 3-bedroom home. A 40’ container can hold about 24 3-foot-wide pallets (or cars and boats). The 40’ is usually a better value for the money. But if you plan on moving the container around, go for the 20’—it will save you many headaches. 3) Do I need modifications? Security. Containers are made of Corten (weatherizing) steel, so they’re impenetrable. Levers work the doors—snap on a padlock and you’re good to go. If your container will reside at a remote cabin or construction site, consider adding a metal lockbox to protect your padlock. Modifications. An extra door (“man-door” or roll-up), a window, or extra vents are easy vendor add-ons. If you can weld, you can do it yourself with a kit! 4) What container quality do I need? New/one-trip containers: Manufactured in Asia; shipped to the U.S. for sale. Generally gray, tan, or green. Rust-free and dent-free. Most won’t have shipping-line markings. 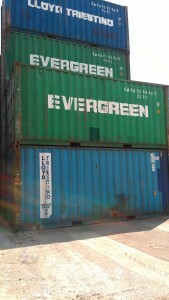 Cargo-worthy containers: Used containers certified as structurally sound for overseas shipping. The best-quality used containers on the market. Some rust, dents, and shipping markings. Wind- and watertight containers: A small step down from cargo-worthy, but still good, solid containers. Their cargo-worthy status may have expired or they may have a defect that does not affect storage performance, but would not meet the standards for overseas shipping. As-is containers: have known problems—a hole, bad floors, a bad roof. Generally are very close in price to a wind- and watertight container. Frankly will cost more to repair than are worth it. Note: An as-is container is NOT the same as a wind- and water-tight container sold “as is” with no warranties (vendors cannot warranty a container once it is delivered). 5) How do I get a container delivered? Empty containers are stored at distribution centers across the country. Your vendor will locate an empty container as close to you as possible and then put it on a truck. The truck will back the container off right where you want it—all you need is a straight and firm patch of ground (paved, gravel, packed dirt are all fine). Want to offload the container yourself? That can lower delivery costs—but only if you happen to own a crane, backhoe or forklift. Shipping overseas? Discuss delivery with your container vendor and shipping line. Location matters: Container prices are usually cheaper on the coasts than inland. Quality matters: A cargo-worthy container costs more than a wind- and water-tight container. But used 20’ and 40’ containers should be similar in price. Delivery details matter: Final costs are determined by how far you are from the closest container and by your specific delivery needs.